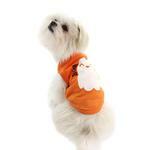 Bring out the spirits this Halloween with the Friendly Boo Ghost Dog Shirt in Orange! 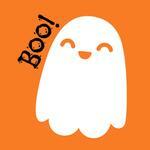 This Friendly Boo Ghost Dog Shirt will make Halloween a bit more fun and less scary. We've designed this custom shirt just for you in our BaxterBoo.com T-shirt Shop for an exclusive Halloween that will have your pup standing out! Custom printed on a soft 100% cotton knit dog tank, your pup is sure to get lots of treats while looking so cute. The 100% breathable cotton keeps your pup feeling comfortable. This dog t-shirt also features a sleeveless style and a high-cut, stay-dry belly for the ultimate in comfort and convenience. This Halloween dog shirt is so comfortable that your pup may want to wear it year round. It's perfect for layering under hoodies too! Care: Machine wash in cold water. Lay flat to dry to prevent shrinkage. Available in a wide range of sizes to outfit the whole pack! Friendly Boo Ghost Dog Shirt - Orange Customer Photos - Send us your photo! Shelby Sadie Pegee attending a Halloween event to support the local dog shelter. All three are rescued from shelter. Love the Halloween tee shirts! We are looking forward to seeing the trick or treaters this year! Posted On 11/08/17 by Becky G from Merkel, TX Yes, Becky G recommends this product! 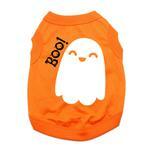 I ordered this for my little Pom - Bella Jo, to wear all thru October. It fits her well, and she looks so cute in it. So it will probably be worn all year too! Posted On 09/28/17 by Jennifer L from Senoia, GA Yes, Jennifer L recommends this product! Love these tees! Super comfy, perfect fit and adorable! LOVE!!! Posted On 06/16/17 by kathleen w from pueblo, CO Yes, kathleen w recommends this product! I think this shirt is so cute. I bought it for my grand dog. His name is Bamboo.I call him BooBoo-So this is a fit. And he is so cute! Posted On 05/25/17 by Noel's legacy from , CO Yes, Noel's legacy recommends this product! Cute little shirt for Halloween. Lightweight so it can be worn all evening. Runs small, get a size larger to allow for shrinking, too. Posted On 03/21/17 by Michelle D from Wichita, KS Yes, Michelle D recommends this product! The difference in sizes is quite a range & the size i need to fit my pooch is a little loose but the next size down would be far too small. The site is so entertaining - I just love "window shopping"